Two years ago, two of the biggest names in the movie industry joined forces to bring a box-office movie for the moviegoers and it was truly a hit. Now, two isn't enough to make a grandest movie for the movie lovers in which they've included another box-office hit maker in the scene. Making three of the renowned artist in the movie industry packed in one extra special movie not only for the kids but for all ages, Si Agimat, Si Enteng Kabisote at Si Ako. This year's MMFF, two of the formidable giants of the local filmmaking world - Vic Sotto and Ramon "Bong" Revilla, Jr. - once again join their stelalr powers and listed the services of an equally bankable actress in the person of Ms Judy Ann Santos, to come up with this next adventure-filled chapter of heroic exploits. 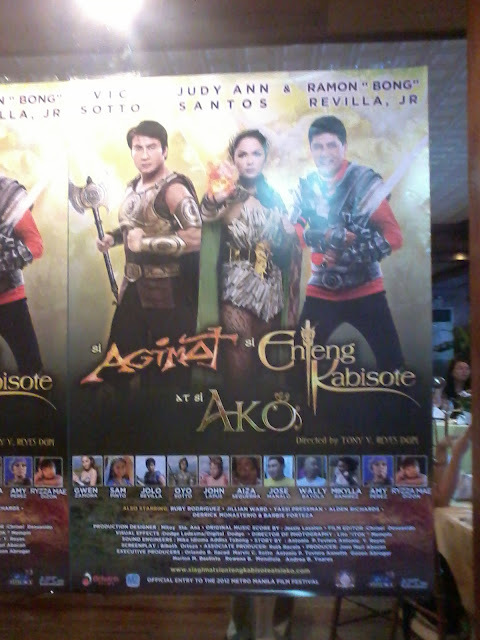 Aside from the team up of the three big giants artists of the movie industry, producers also did joined forces namely, Imus Productions, OctoArts Films, M-Zet Tv, APT Entertainment and GMA Films not only to lord over the tills but to bring cheers, goodwill and love as it once again espouses famly values, adventure, fun and magical fantasy. 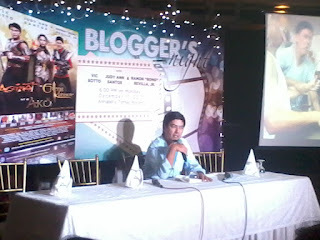 As what Vic Sotto have mention in the Bloggers' Night of Si Agimat, Si Enteng Kabisote at Si Ako, he wanted the "Enteng Kabisote story to be special" and perhaps that's the reason why it is only shown every December during the Metro Manila Film Festival where kids could enjoy the fantasy adventure. Bosing Vic during the Q & A. Furthermore, Bossing Vic mentioned also that they wanted to surpass the previous Enteng Kabisote series and made this one even more grandeur and that's why they've included Ms. Judy Ann Santos. Director Tony Y. Reyes, who has helmed all the "Enteng Kabisote" series in the recent MMFF past, says that the challenge to outdo the last one is always the hardest. According to him "in 2012, Sen Bong and Bossing Vic already teamed up and it broke all box-office records. This time around, how do we top that? That's when the name of Ms. Judy Ann Santos came in. We now have not just one, not two, but three box-office giants in one movie." This brings big budget, great and spectacular places in the Northern part of the Philippines, dedicated sound stages, and CGI effects done abroad, thus making the movie grand in every aspect as the five production companies backed this one great project. The screenplay was done by Ms. Bibeth Orteza and Jermyn Aven Jacob. Not to spoil more of the details about the movie, the story begins with the establishment of the the three different worlds, bound to meet for an adventure like no other. The movie once again is starred by Vic Sotto as Enteng Kabisote, Ramon "Bong" Revilla, Jr. as Agimat and Judy Ann Santos as Princess Angelina Kalinisan Orteza. Together with the heavyweight support casts led by Wally Bayola, Jose Manalo, Sam Pinto, Gwen Zamora, Aiza Seguerra, John Lapus, child stars Jillian Ward and Ryzza Mae Dizon, Yassi Pressman, jolo Revilla, Oyo Boy Sotto, Ruby Rodriguez, Amy Perez, Barbie Forteza, Alden Richards, and Anton Revilla. So this coming December 25 let the kids and kids-at-heart enjoy triple fun, triple adventure and triple thrill as the story of Agimat and Enteng's friendship and partnership continues plus the addition of Angelina Kalinisan Orteza mixed together in "Si Agimat, Si Enteng Kabisote at Si Ako". PINOY TV- is the best place to watch GMA 7 and TV 5 replays online. Our goal is to provide every Filipino especially OFW a free pinoy tv over the internet. doesn't own any of the videos that are posted here, all videos posted here are publicly available on YouTube and or other video streaming websites on the internet On http://www.mediafevers.com/.